It’s been cold and rainy this winter (well, at least for California), and because of this I’ve found myself reaching for my Dutch oven to cook soups and stews at least two or three times each week. The one I keep making again and again? It’s this spicy sausage, potato, and kale soup that I fell in love with a couple winters ago. This paleo, gluten-free, and Whole30-approved recipe is hearty, nutritious, and so flavorful, plus it’s easy to make and comes together in about 45 minutes. I think that adding kale to soup is one of the best ways to enjoy lots of this leafy green, the spice from the Italian sausage goes so nicely with it, and the potatoes make this a filling, well-rounded meal. And did I mention how delicious it is? Because it is. My boyfriend and I seriously battle over leftovers of this stuff. Oh, and if you’re not already familiar with the wonderfulness of the Dutch oven, and you also make (or want to make) lots of soups, chilis, braised dishes, and such, I highly recommend adding this thick-walled cooking pot to your cookware collection pronto. Otherwise you can just throw everything together in a regular ol’ soup pot. Heat a Dutch oven or large pot over medium-high heat. Add the olive oil and, once hot, add the sausage. Break up the sausage with a wooden spoon and cook until slightly browned, about 6-8 minutes. Once browned, remove the sausage and set aside. Add the onion to the Dutch oven and cook until translucent, about 5 minutes, stirring occasionally. Add in the garlic and cook until fragrant, less than 1 minute. Re-add the sausage, as well as salt, pepper, chili pepper flakes, potatoes, chicken broth, and the bay leaf, and stir to combine. Bring to a boil, then reduce heat, cover, and simmer over low heat until the potatoes are tender, about 25 minutes. Remove the bay leaf, add in the kale, and continue to cook for about 5 more minutes, until the kale is tender. Season again as needed, serve, and enjoy! There’s a good chance you’ve heard a friend mention Whole30 while they pass up a drink at happy hour, or a coworker talk about the program while munching on a grilled chicken salad in the breakroom. Foods to be enjoyed during the month are meat, eggs, seafood, vegetables, fruits, and natural fats. Whenever possible, it’s recommended to opt for sustainable, ethically-treated, grass-fed, pasture-raised, and/or organic fare. The goal of the Whole30 is to make intentional, mindful food choices, feed your body well, and hopefully shift your emotional relationship with food. It’s NOT a diet. There’s no calorie counting, portion limits, or weigh-ins. You nourish your body by eating real food when you’re hungry, and that’s about it. Completing a Whole30 isn’t necessarily a walk in the park. It can be challenging, even for those who tend to eat on the cleaner end of the spectrum. But I highly recommend it to anyone who wants to change their relationship with food for the better. And you’ll learn A LOT while going through the program (check out what I discovered from last year’s Whole30). Plus, the food you enjoy on a Whole30 doesn’t have to feel limiting or sacrificial. Some of my favorite recipes that I make year-round are Whole30-approved (or can be with simple modifications). Need a little help getting started? Here’s my Week 1 Whole30 Meal Plan. It includes leftovers and a few repetitive meals, but I find that relying on repeat meals prevents me from wasting time making food decisions and allows me to batch cook, which is a huge timesaver. Keep in mind, I’ll also add in a pre-workout snack if I need one (a banana or apple + almonds is a good go-to). Like so many others, I’m on the January Whole 30 train with the hope of resetting my body after a December of chocolate, cheese, and enough wine to make any Game of Thrones character blush. By the end of December, I was feeling sluggish, bloated, and lazy about making food choices. Enter the Whole 30! An eating program that cuts inflammatory, processed, and hormone-unbalancing food groups (like grains, dairy, artificial sugars, and alcohol) for a full 30 days. If you haven’t heard about it, check out the details here. I completed my first Whole 30 in August of last year, and while it was hard at times (like anything worth going after), I felt incredible by the end of the month. In fact, by the end of my second week on the program, my energy levels were through the roof. I was running faster, lifting more weight, and once home, sleeping more peacefully. The Whole 30 creators call this energy Tiger Blood, and it’s ah-mah-zing. Besides the increased energy, I love that the Whole 30 never made me feel totally deprived. (Well, except for when I had to order a water with lime when going out for drinks with friends. Let’s be real; that part sucked.) I LOVE food and cooking, and both are an essential part of who I am. 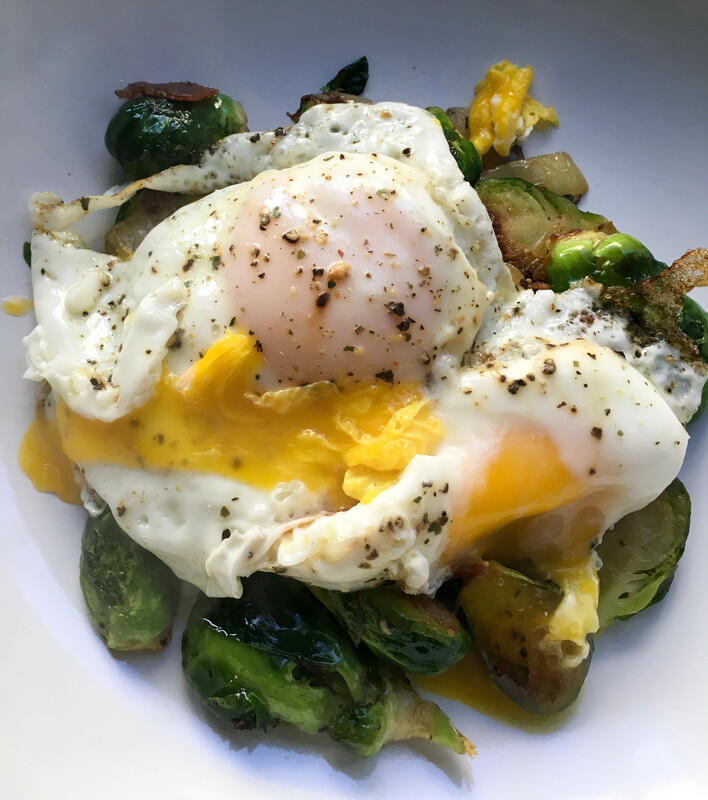 The Whole 30 celebrates healthy food and allows you to enjoy tons of nourishing, homemade foods—like this brussels sprouts and bacon dish with eggs. This Whole30 is going to be SO easy! I love the thought of having omelets for breakfast every day.